← Bring me a Higher… Purpose! Mobile devices and apps are no longer the hot new craze. The B2C (Business-to-Consumer) sectors have taken care of that. Mobile devices have become an essential item for communication and internet access, and as Cisco reports, by the end of this year (in three weeks!) the number of mobile-connected devices will exceed the number of people on earth. By 2017, it’s predicted there will be nearly 1.4 mobile devices per capita. We’re now seeing companies like Lenovo, the world’s largest PC maker, selling more mobile devices than PCs. And as you’re undoubtedly aware, smartphones are a huge part of this mobile device equation. The growth of smart phone usage in 2012 was 81% and has only increased since. We’re using our smartphones for MUCH more than phone-calls though. Downloading applications, checking email, accessing the internet, getting directions, making dinner reservations, paying for purchases and meeting Mr./Ms. Right are just a few examples of ways smart-phones and mobile devices are being used today by people all ages from all walks of life. The bottom line is people are living their lives on mobile. And as long as the product is intuitive, easy to use and fast, the potential for success on mobile devices is huge. HR Technology applications are no exception. A 2013 Mobile Consumer Report from Nielsen found that 82% of U.S smartphone users browse the web on their smartphone, and 63% use smartphones for social networking sites like LinkedIn, Facebook, and Twitter. According to Talent Management Headquarters, one billion (1,000,000,000) job searches are conducted on mobile devices each month! Mobile recruiting is well on its way to being the next big thing for talent acquisition. This makes sense when we consider that we can use mobile devices during short moments of down time, on a bus or during a lunch break. As career sites and job postings become increasing mobile friendly, it’s likely that both passive and active job seekers will turn to their mobile devices before they turn to their desktop to hunt for jobs or job search related information. And mobile recruiting offers organizations the benefit of exposure to job seekers who may not own or be frequent users of computers. More importantly, with so many employees working from mobile devices, it has become increasingly critical for employers to provide HR information through vendors with easy to use, native mobile apps. Perhaps this is the new focus: B2T – Business to Talent! 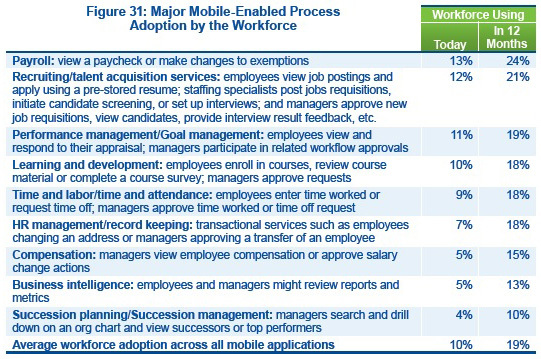 Mobile HR applications offer employees (as well as HR managers) instantaneous interaction and engagement with HR Data like payroll and benefits information, recruiting/talent acquisition services, performance/goal management, and time and labor information – even more so than using a laptop or desktop. And in the day and age when all of us are used to instant access when we are living our non-work related lives, having these important processes and data easily accessible are becoming a must-have not a nice-to-have. In 2011, the ADP Research Institute looked at how mobile technology could make HR mobile solutions a game-changer. Respondents reported a significant benefit in using HR mobile solutions, citing improved workforce satisfaction, improved real time decision making, and improved workforce productivity. So the B2T revolution is here. Mobile technology has revolutionized much in our lives and for HR leaders and employees there is more change to come. User friendly HR applications for mobile devices will prove an effective way to increase efficiency for managers and employees, just as the popularity of job searching on mobile devices will undoubtedly impact how we recruit. Communicating with talent – current and future – via mobile really could be a game changer for employers, employees, job seekers and HR technology providers. The B2T bottom line: employees are consumers. And they expect to have consumer-like experiences with the technology and software at work and about work. And if you aren’t providing it for them, they’ll likely use their smartphone to find another employer! *This post is part of SilkRoad’s first annual #HRTechTrends Blog Carnival. A recap of all participants will be posted on SilkRoad Ink on December 20, 2013.